This demo shows how Cloud services can be used for remotely monitoring and controlling a device. This demo uses Amazon's Simple Queue Service (SQS) and Simple Notification Service (SNS). Four relays are used as digital outputs, four switches as digital inputs and temperature/humidity sensor as transducer input. 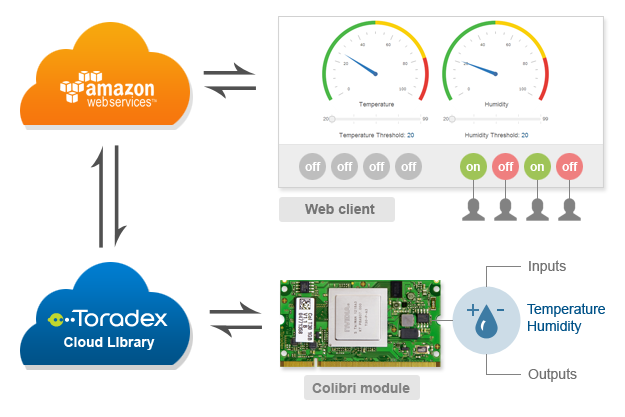 Status of the inputs and temperature humidity data is periodically sent to the SQS queue by the Colibri module running WinCE, from where it is retrieved by a web page and displayed. In case relay status change is requested (using button control on webpage), webpage sends message to the queue which is fetched by the Colibri module and the status of relay is updated. There is a provision for sending notification/s or alerts, in case Temperature or humidity goes above a threshold value. Notifications are sent to all the users subscribed to the service (subscription option is available on the webpage). Real world example can be Web SCADA for Plant monitoring. 4x Input Switches connected to Iris board connector X16 (Pin 19, 20, 29, 30). 4x Output Relays connected to Iris board connector X16 (Pin 37, 38, 39, 40). Temperature and Humidity Sensor (UARTA) connected to Iris connector X16, Pin 28 (RXD).